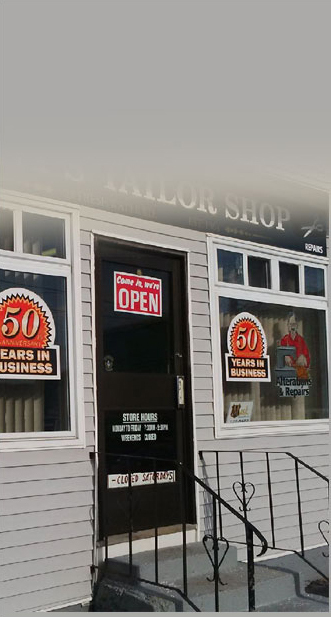 Tony's Tailor Shop has over 50 years of experience and we take pride in our work. We are professional tailors and we focus on giving each customer quality and prompt service. The co-owners, Tony, Jr and his brother personally measure and pin each piece of clothing. Says the owners, "Please take the time to ensure your clothes fits who you are"
Through the art of custom tailoring and general alterations, Tony's alteration experts transform garments so that they complement your body perfectly. Whether that is the super modern close and full tailoring or a more relaxed comfortable look. Please remember, even the most expensive pieces may not fit you as properly as they should at first. This is why our tailoring service offers professional clothing alteration services for your comfort and style. Alterations are also available for wedding attire. Allow our artists to alter your clothes so that your style fits you comfortably. Our alterations will eliminate the impression that your clothes are too big or too small, leaving you with the look you deserve.